A white paper is a cross between a magazine article and a sales brochure. It can be divided into two parts; an educative magazine which is the first part (80 to 90%) and a second persuasive brochure part (20 to 10%). These features of educative content followed by persuasive marketing material make it one of the most powerful and sought after marketing tools. 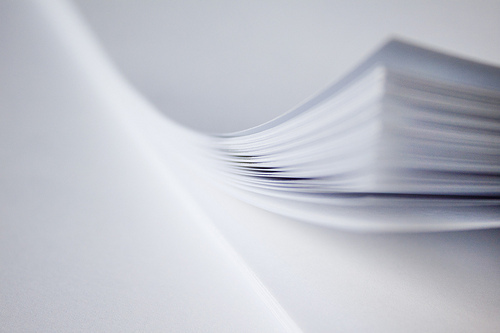 How Did White Papers Come into Existence? In the past when British Members of Parliament wanted to put an idea in front of the government, they needed to build book-like files which were hundreds of pages long outlining their ideas and how they could be implemented to better the country. These books were usually bound properly, but sometimes, when MPs didn’t have time, they used to simply wrap them in sheets of white paper and that’s how the name “white paper” came into existence. Slowly B2B companies that sold expensive products costing thousands of pounds began using shorter white papers to explain their services/products and the solutions they offered by educating the reader. After seeing how effective this was, other B2B companies with lower priced products began using them too and now, with the current boom in inbound marketing, even B2C companies have started employing them. How Does a White Paper Work? Direct marketing is drying up at the moment. People can now mute TV adverts, escape cold callers by screening caller IDs and avoid unsolicited emails with direct marketing messages through spam folders and special email filtering software. People are turning to search engines, social media and apps to actively look for content that can help them. Most of the common forms of content they come across through these channels are blog posts and articles. Though these are very effective in attracting visitors and educating them, they are actually not that effective in generating leads. It will usually take up to six months for your blog to start generating leads. This is what makes white papers so important. As they contain both educative content in the form of a magazine article, and direct marketing material in the form of the brochure at the end, they can help generate leads much more quickly than blog posts. When a client comes across your white paper, they will read it to educate themselves about the problems faced by their company and how to solve them. Learning of the problems, they will worry that these are hindering their company’s progress, but when they go on to read that there are solutions available, they will feel relieved because they can take action to solve them. After they have learned about possible solutions, they will usually study the sales brochure section at the end of it to find out more about the experts who created this helpful document. This section is what convinces them to hire the creators of the white paper to help them. The client will feel more comfortable hiring experts who know what they are doing and have produced results, instead of experimenting by themselves and facing the risk of losing a lot of time and money. If you would like to learn more about how to write a white paper for your business, subscribe to this Blog and follow our series of posts on the subject over the coming months, and be the first to see the new white paper on creating white papers! You can subscribe using the options top right of this post. Have I missed out any important points? Would you like to share any of your tips with us? Mitt Ray is the Director of The White Paper Blog and the author of the book White Paper Marketing. You can follow him on Twitter on @MittRay.